1. Preheat the oven to 200˚C, gas mark 6. 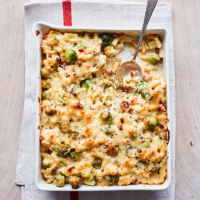 Cook the macaroni in boiling salted water for 4 minutes, then add the sprouts and cook for a further 4 minutes, until the pasta is tender. Drain well and set aside. 2. Meanwhile, melt the butter in a large saucepan and cook the pancetta for 5 minutes, until crisp and golden, then remove with a slotted spoon (leaving the fat behind) and set aside. Stir the flour into the fat and cook for 2 minutes, then gradually stir in the milk to form a smooth sauce. Bring to the boil and simmer for 2 minutes, then remove from the heat and stir in ⅔ of the grated cheeses.